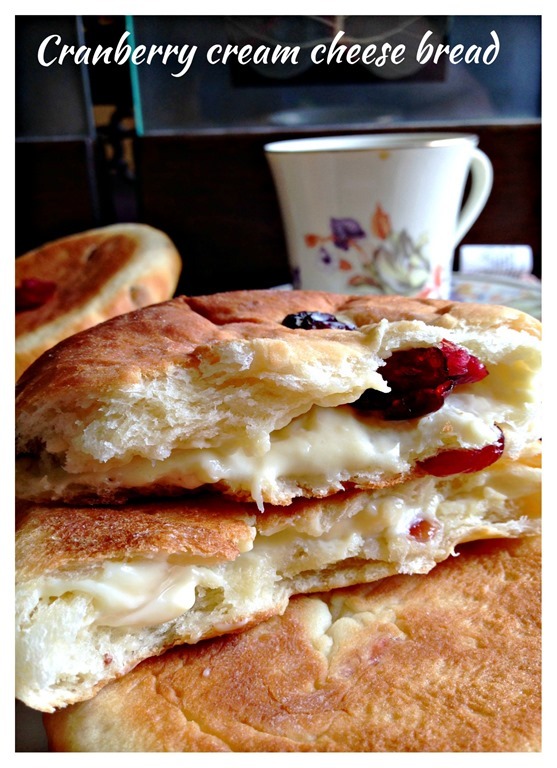 I had always wanted to prepare this bread but I have never take a move to prepare it as I have either forget to buy cream cheese or cranberries. Since I have both items at home yesterday, I have decided to give it a try. When I was preparing the bread, I knew it will be a soft bread. For the first proofing, it requires to proof until 3 times bigger. In addition, the bread dough is very sticky and shaping handling is quite a challenge. 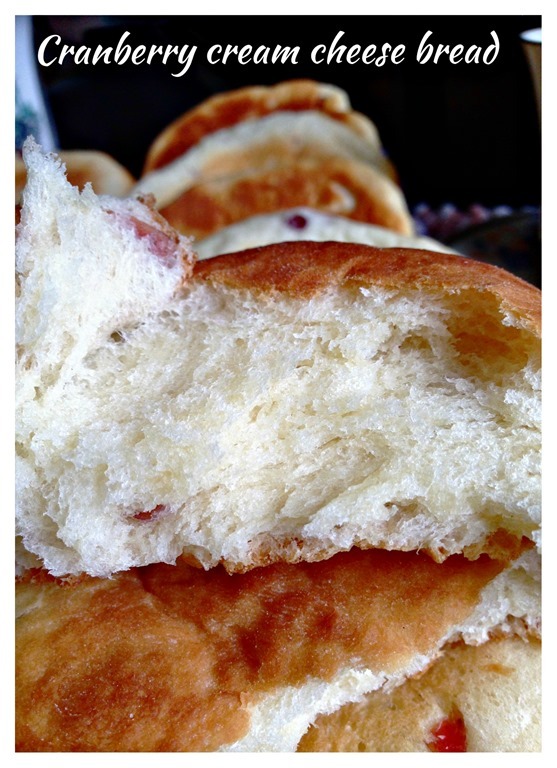 But when I took the first bite, it confirmed that it is a very fluffy soft bread, resembled those that I have purchased from the famous bakery chains Bread Talk or Barcook Bakery. As the original recipe requires about 250 grams of cream cheese, what I have on hand is only about 120 grams of cream cheese, therefore some of the buns have no fillings in it.. 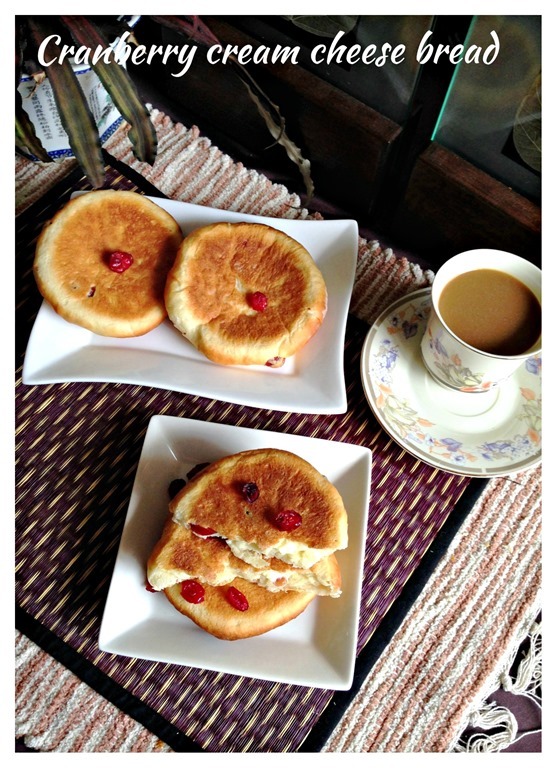 I thought it might also good to prepare the buns to show readers how the fluffy the buns are. 250 grams or ml of lukewarm water. 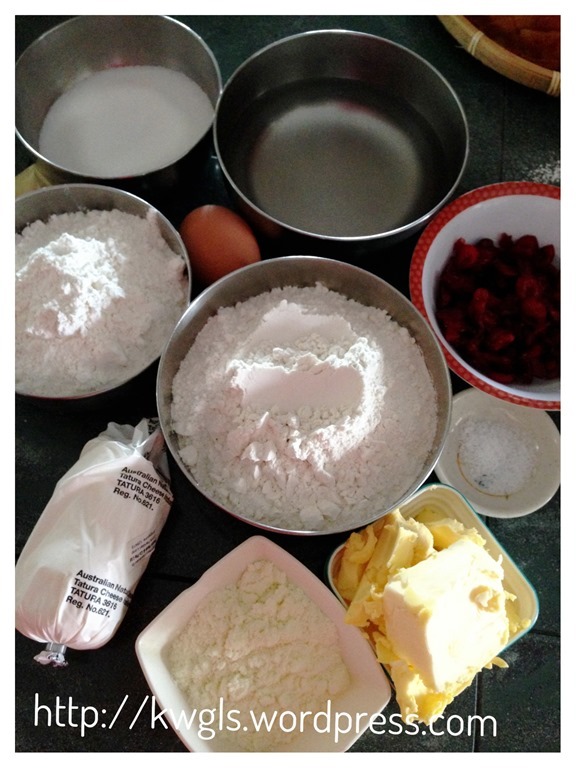 Put all dry ingredients (except butter) in the mixing bowl, use a tablespoon to stir and make a well in the centre. Crack the egg and put in the lukewarm water. 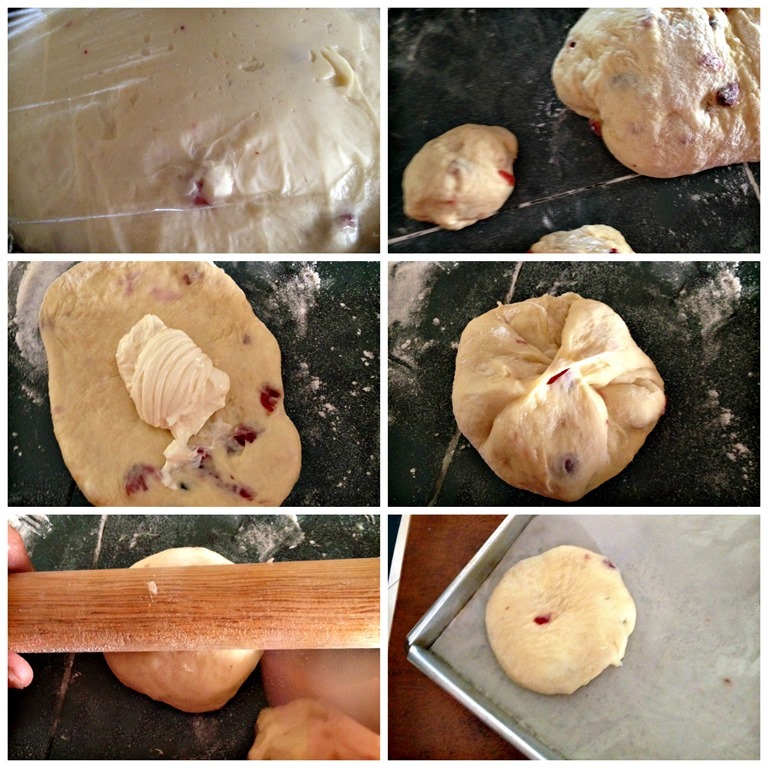 Use the tablespoon to stir until a sticky dough is form. Transfer to the mixer with a dough hook, beat the dough at medium speed until the dough are smooth (about 5-6 minutes). 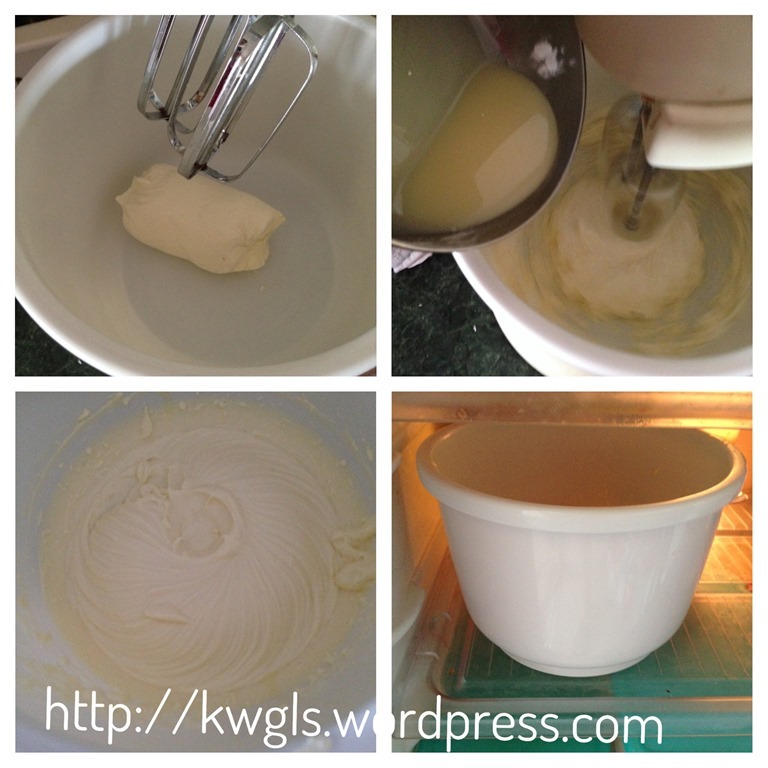 Add in the soften butter, beat using high speed until the dough leaves the side of the mixing bowl (about 10 minutes). Add in the cranberry and “beat” until well mixed (about 1-2 minutes). Transfer the dough to a flat floured surface, lightly knead until it is smooth. Proof in a greased bowl until it is TRIPLE in size (it took me about 40 minutes in the hot morning). Note that this dough is rather sticky, if it is difficult to handle, add in bread flour tablespoon by tablespoon until you can shape the dough. 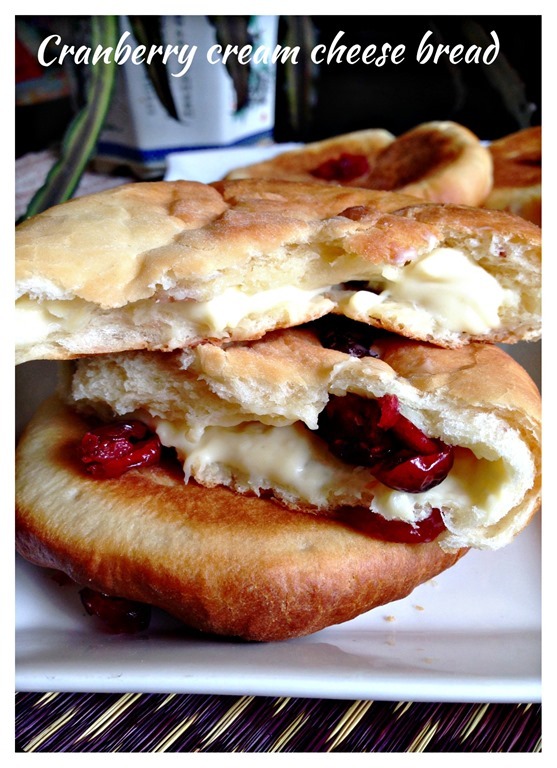 While your dough is proofing, cream the cream cheese until light and fluffy. Add in condensed milk and beat until well combined. Chilled in the refrigerator. Chilling is to facilitate the wrapping process. After you beat the cream cheese, please take some and taste if it suits your taste bud. You can either add some castor sugar or more condensed milk if you found that it is not sweet enough. Once the first proofing is done, transfer out to the floured surface, divide the dough into 75 grams per bread (or your desired size). Lightly knead the dough, flatten it using a rolling pin. Put 1-2 tablespoons of cream cheese on the dough, seal the edges and use the rolling pin to flatten the dough as flat and as round as possible. Transfer to the greased baking tray and let it proof until double in size. Leaves adequate space for the expansion. Once the second proofing is done, bake in the oven for about 15 minutes or until the top of the bread turns golden brown. 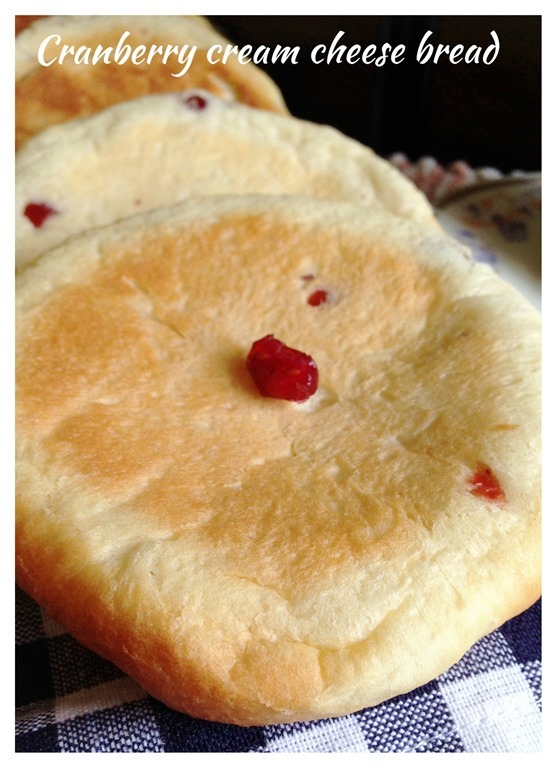 (Subsequent to the issuance of this post, some readers have highlighted that in order to make it flat, topped the tray with the dough with another baking tray, as such, the dough will not rise above the height of the baking tray. In this case, you will need to grease the bottom of the top baking tray). This is a rather simple recipe except the dough is slightly soft and more difficult to handle. Add more flour if you feel that it is too sticky. Do give it a try and let me know about the outcome of your bakes. 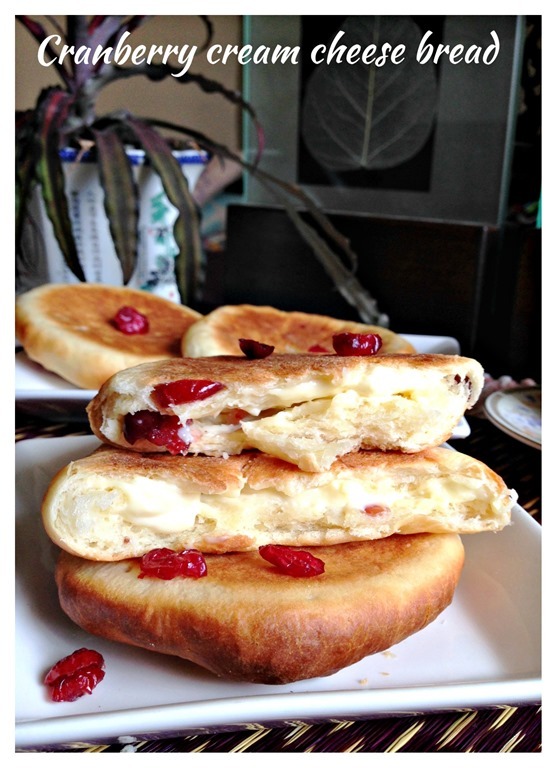 This entry was posted in Breads and Pizza, Food Preparation Series and tagged 8, Barcook, Cranberry Cream Cheese Bread ， 蔓梅奶酪面包， Breadtalk, cream cheese bread, flat bread, GUAI SHU SHU, Guaishushu, kenneth goh, postaday. Bookmark the permalink. Thanks for sharing, Kenneth. This bread is yummy, will give a try. Once again, thanks! Hi, I just tried baking this. 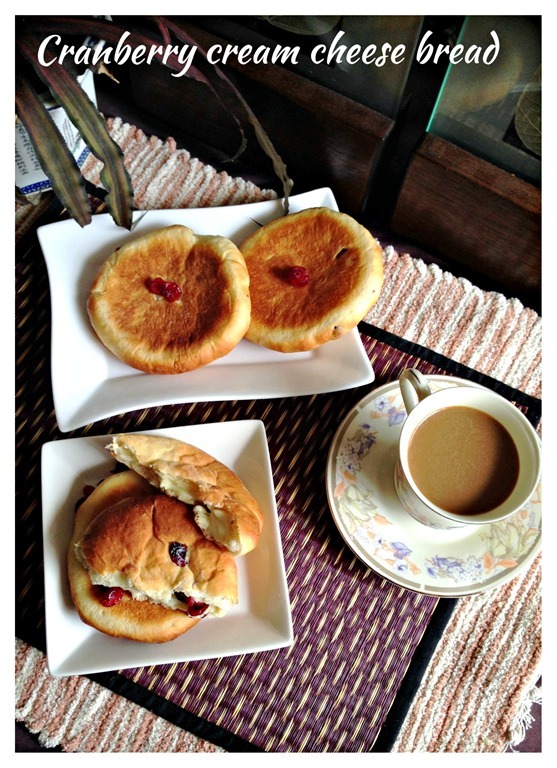 I love the taste and the soft texture of the bun! But my cream cheese filling is powdery instead of creamy, is it my oven too hot? And my bun is a lot “fatter” , not flat at all. shape wise should be because of shaping. Powder cream cheese, is it because of the brand? do you add condense milk? I use Philadelphia cream cheese. Yes, I added condensed milk. Hmmm, never encountered this case before. .. I tried out your cranberry cream cheese recipe. Thumbs up. Hi, I would like to seek advice. 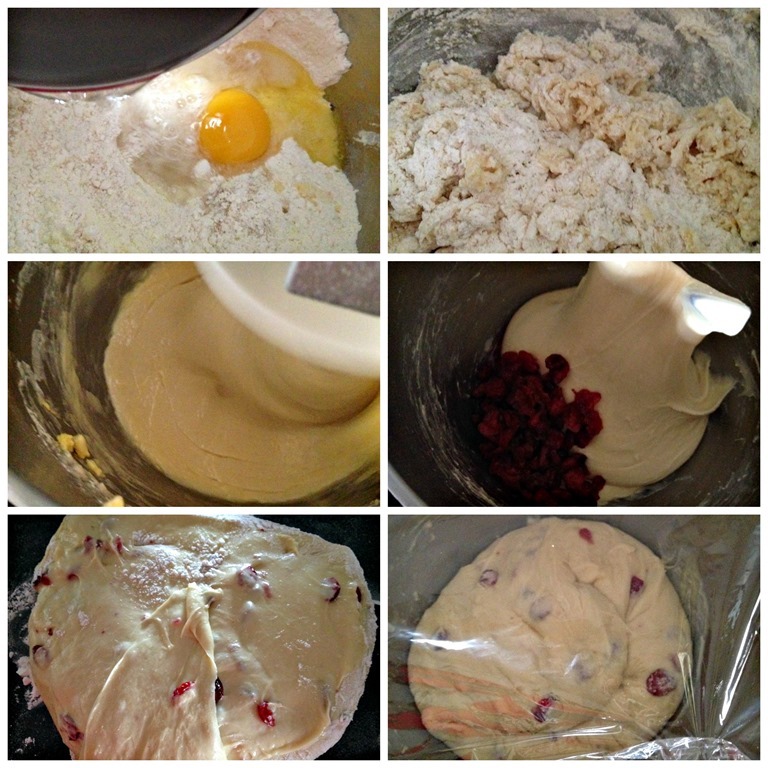 I’ve tried your receipe of cranberry bread. I’ve used cake flour and bread flour combi and after bake the bread is abit hard not as soft. Kindly advice what’s thr problem? Likely to be under proofed. Sorry to hear that. 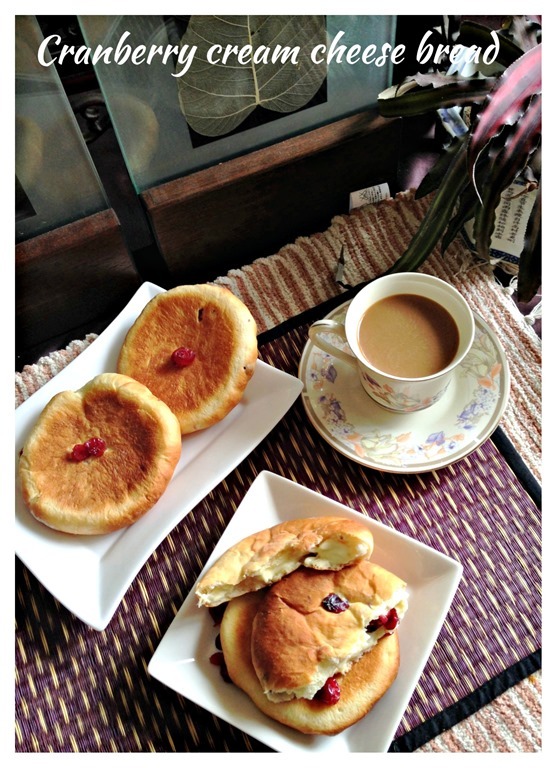 Hi, tried making this on Sat…turn out successful..taste nice and fluffy…thanks Kenneth for sharing..
Hi,I tried this bun in Singapore and absolutely loved it. I definitely want to try to make it at home.What type of cranberries exactly do you use? Dried sweetened cranberries or fresh? Thanks! I made it today and it turned out pretty good 🙂 The buns turned quite big though. I guess I’ll use a bit less yeast next time. 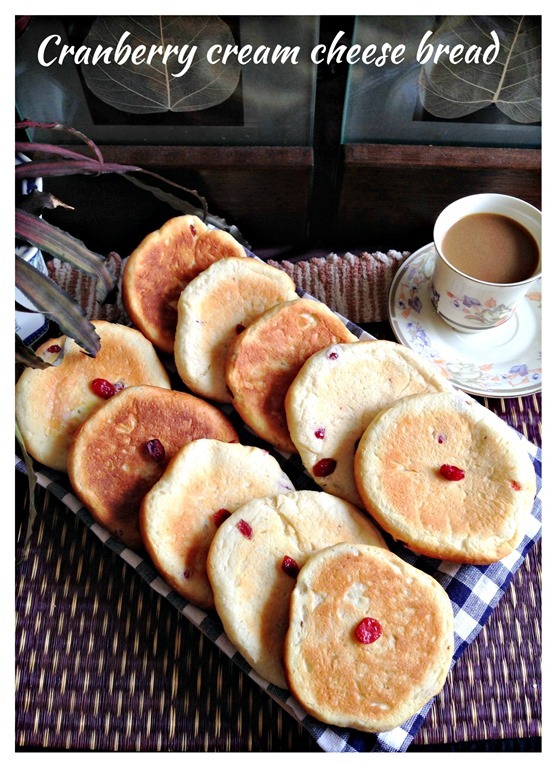 Hi for this recipe can I use bread maker to do d kneading n proofing? Bread flour is a good alternative too. Made them last night for breakfast the next morning! Was wondering how to store it actually! Since there’s cream cheese will it be neves dart to store it in the freezer if not consumed immediately? How long can it keep outside at room temperature? Usually one recipe is not many pieces and kids like to eat. Within 2 days we finish all. I put at room temperature and never encounter problem. If your family is small, suggest half the recipe. Hi, can I replace milk powder with fresh milk instead? Can we use bread machine to do the kneading and poofing job? Can I make the dough in bulk and keep for few round of baking? I mean keep in fridge for days or weeks? if can, how? Hi, should i use weight scale to measure the ingredients or follow the weigh measurement from the measuring cups /spoons? I really dont like cranberries. 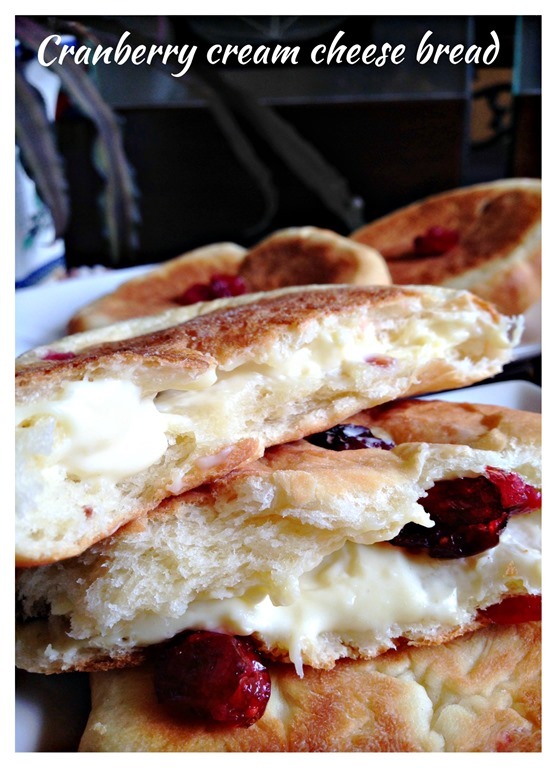 Can i make this bread without the cranberries? I really love cream cheese bread when i was in Singapore..
Definitely, you can use raisins if you want or totally omitted..
Would really like to know whats the purpose of milk powder in this bread that it can actually substitute by adding more flour as mentioned by you. Do u think I can use Happy Call to “bake” it ? Milk powder is to make it milkier and tastier and more aromatic.. 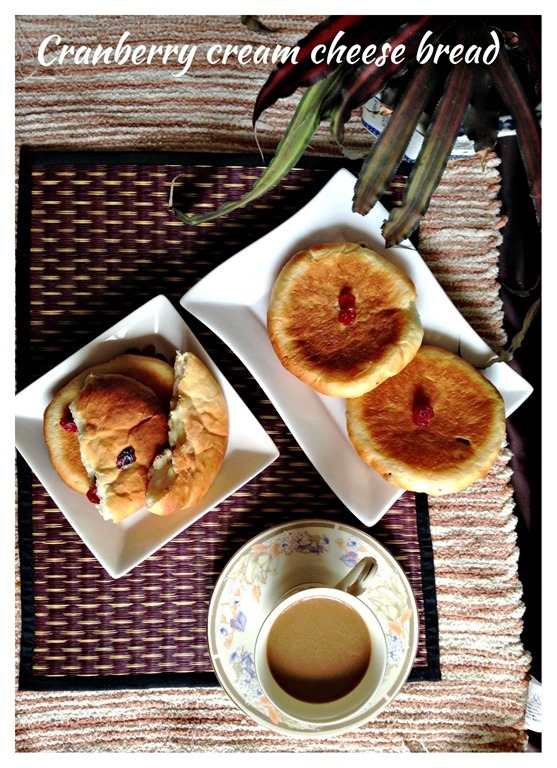 If English muffins can be pan fried, I think happy call pan should be an alternative. Ho Kenneth. Thanks for your reply. Baked this today using oven. Taste is good but didnt have another tray to put on top of the dough and thus they look like buns rather than ah bian :p will perfect it and update.